A close-up from a six-pane image of colliding galaxies in the Hercules galaxy cluster. An intergalactic traffic jam formed by galaxies crashing together takes center stage in a new image of the well-known Hercules galaxy cluster. The lively cosmic scene was captured by the European Southern Observatory's VLT Survey Telescope at the Paranal Observatory in Chile. The dynamic interactions taking place in the Hercules cluster make these galaxies look like the young galaxies of the more distant universe, according to ESO officials. The Hercules cluster, which is also known as Abell 2151, is located about 500 million light-years from Earth in the constellation of Hercules. While there are no giant elliptical galaxies nearby, the irregularly shaped Hercules cluster contains a wide variety of galaxy types, including many young, star-forming spiral galaxies. Pairs of galaxies can be seen throughout the image, bumping up against one another as they prepare to merge into single, larger galaxies, ESO officials said. These collisions, plus the numerous gas-rich spiral galaxies in the cluster, are reminiscent of young galaxies in the distant universe, leading astronomers to estimate that the Hercules cluster is relatively young. This new image, taken with the European Southern Observatory's VLT Survey Telescope (VST), shows a wide variety of interacting galaxies in the young Hercules galaxy cluster. This picture has been cropped and does not cover the full VST field of view. Galaxy clusters form when smaller groups of galaxies are pulled together by their own gravity. As these groups approach one another, the cluster becomes more spherical and compact. Meanwhile, as the galaxies come closer together, they begin to collide. In clusters dominated by spiral galaxies, these collisions have the power to distort the spiral structures and strip off their gas and dust — the raw materials from which new stars are born. This is why most off the galaxies in a mature cluster are elliptical or irregular in shape, the astronomers said. Typically, one or two large elliptical galaxies, formed by merging smaller galaxies, can be found at the center of these adult clusters. The Hercules cluster stands apart from nearby groups of galaxies because it does not contain giant elliptical galaxies. These highlights of the young Hercules galaxy cluster show a wide variety of interacting galaxies. The numerous interactions, and the large number of gas-rich, star-forming spiral galaxies in the cluster, make the members of the Hercules cluster look like the young galaxies of the more distant universe. The Hercules cluster is thought to be made up of three small clusters and groups of galaxies that are currently merging into a larger structure. The entire cluster itself is also fusing itself with other large clusters to form a galaxy supercluster, ESO scientists explained. These giant assemblies are some of the largest structures in the universe. 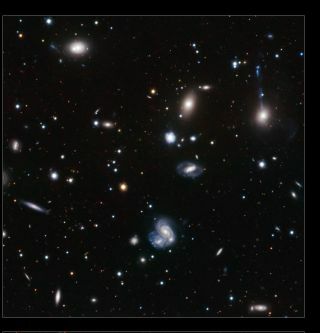 In this new image, the galaxies of the Hercules cluster can be seen, in addition to many fainter background objects that represent galaxies that are much further away. In the foreground, several bright Milky Way stars are visible and interestingly enough, the short trails of asteroids as they flew across the image during exposures can also be seen. The new picture of the Hercules cluster was taken with the VLT Survey Telescope's huge 268-megapixel OmegaCAM, which is capable of producing images across large areas of the sky.